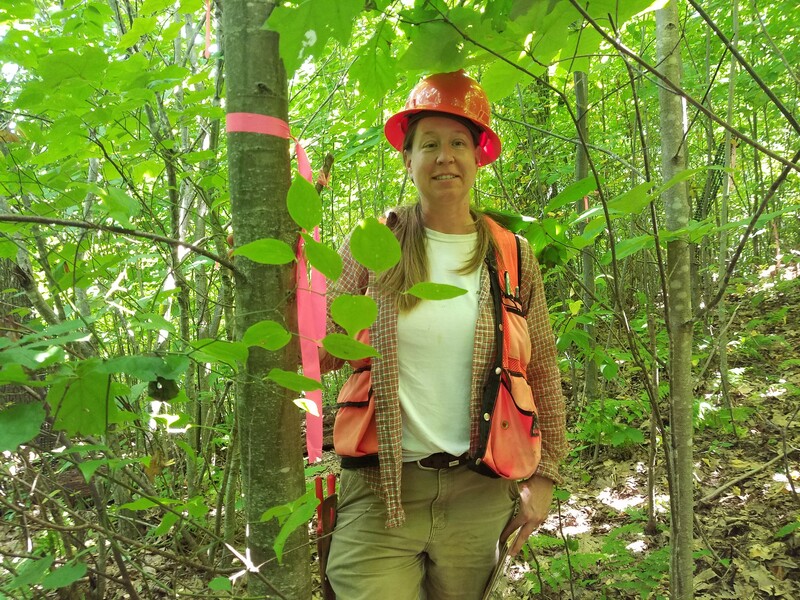 Stacy Clark stands next to a 10-year-old hybrid chestnut seedling planted as part of a long-term research project on the Cherokee National Forest. Photo by Stacy Clark, USFS. 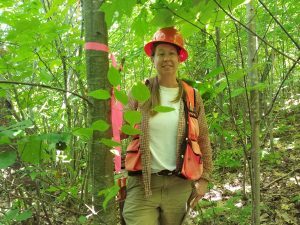 After eight years of field testing, USDA Forest Service research forester Stacy Clark and her colleagues evaluated blight resistance and survival of the backcross-generation American chestnut seedlings, known as BC3F3. Their results were published in Forest Ecology and Management. Researchers with The American Chestnut Foundation have spent decades developing a backcross breeding program to produce trees with the blight resistance of Chinese chestnut (C. mollissima) and the favorable growth characteristics of the American chestnut. Their hope was that the hybrid seedlings would be capable of restoring long-term ecosystem processes and functions. 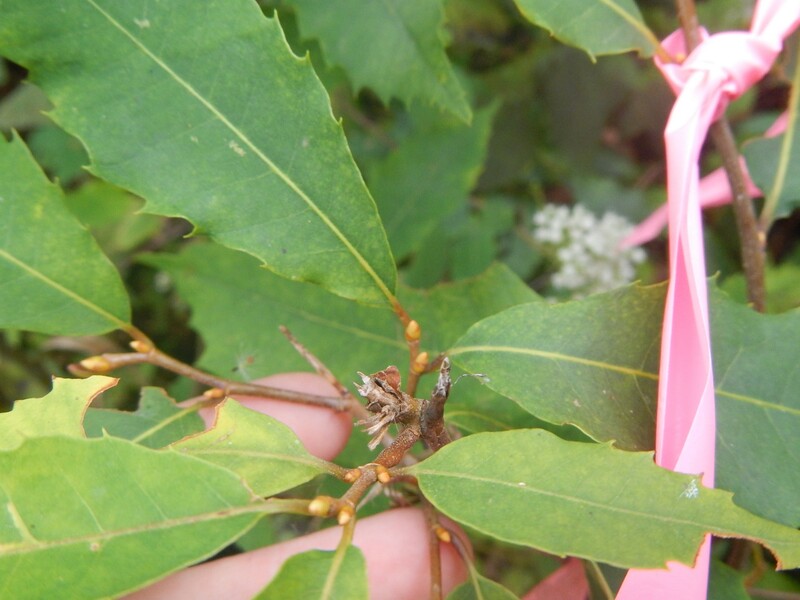 In 2009, the Southern Research Station partnered with the Foundation, as well as the University of Tennessee’s Tree Improvement Program and the Southern Region of the National Forest System to test blight resistance in hybrid trees. The team planted 1,100 chestnut seedlings in the Cherokee, Jefferson, and Nantahala National Forests in real-world forest conditions. The seedlings were planted in mesic, even-aged regeneration harvests. They are the first forest field tests of blight resistance of BC3F3, the third generation of the third backcross, and the most advanced breeding generation currently available. Repeated browsing by white-tailed deer on American chestnut seedlings will stunt growth and may eventually lead to mortality. Photo by Stacy Clark, USFS. The researchers also compared BC3F3 with less advanced breeding generations, such as BC1F3 and BC2F3, along with disease-resistant Chinese chestnut and disease-susceptible American chestnut. After eight years, blight had infected between 17 and 54 percent of all trees planted: 40 percent of trees in VA, 17 percent of trees in TN, and 54 percent of trees in NC. The BC3F3 generation exhibited resistance more similar to the Chinese chestnut than the American chestnut. Blight was more likely to infect trees after they grew three to five inches in size at the base, as the study showed. The researchers found that 31 percent of the planted seedlings died prior to blight detection. This non-pathogen-related mortality was probably due to factors typical of hardwood plantings, including repeated deer browsing and native and nonnative pest damage. The Forest Service manages approximately 15 million acres (shaded red) within the former range of the American chestnut (shaded blue), offering substantial opportunities for research and restoration. USFS image. 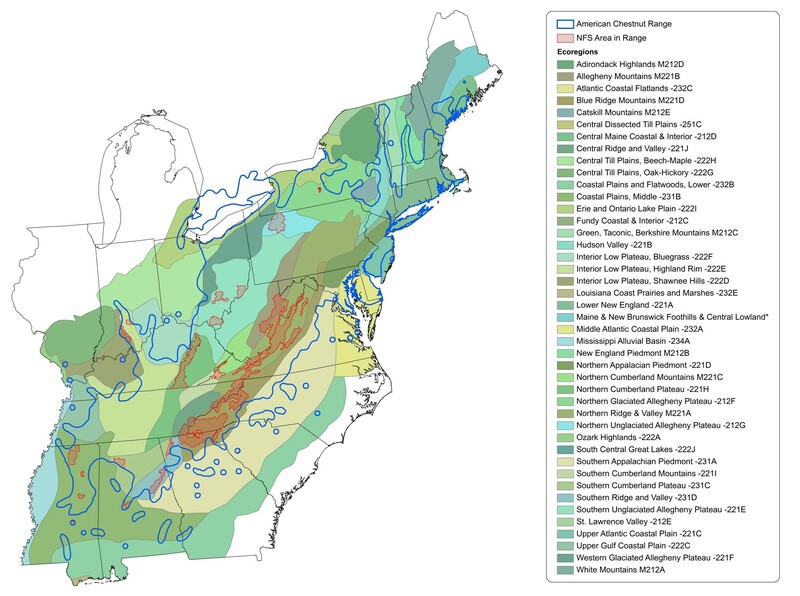 The American chestnut was a forest species of great economic and ecologic value — providing ecosystem services such as mast production, rot-resistant lumber, carbon storage, insect diversity, and tannins for tanning leather. The leaves and nuts were a source of food for wildlife, birds, and many mammal species and a commodity product and food source for Appalachian subsistence farmers.